The high-collared Chinese tunics tailor-made to be worn by the world’s most prominent leaders in Beijing last week during the Asia-Pacific Economic Cooperation (APEC) Forum has sparked a new online fashion trend. 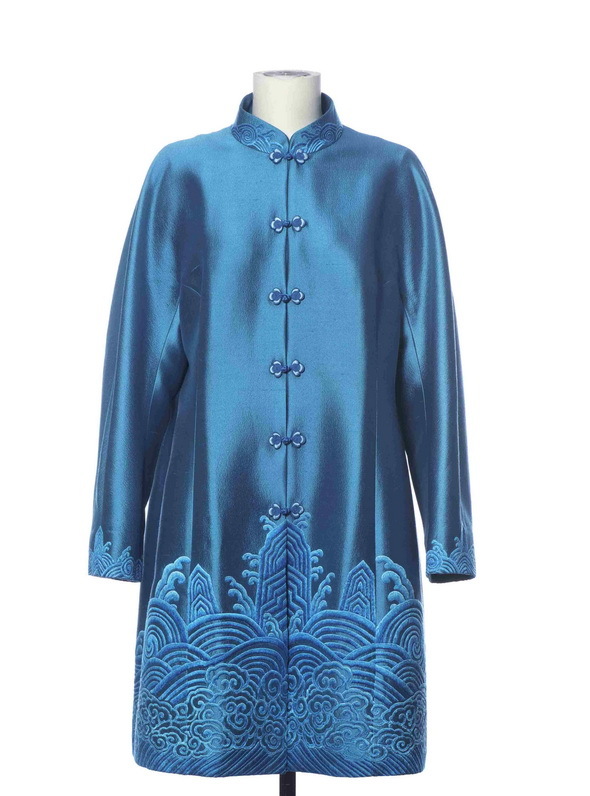 Conceptualized by fashion designers specifically for the meeting, the traditional Chinese garment utilized dark-blue damask with watermarks, a technique linked to textile methods from the Song Dynasty (960-1279). 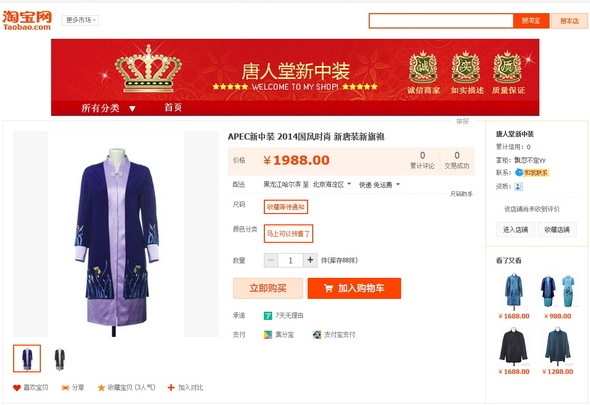 Just days after leaders were photographed wearing the garment, online retailers began offering copycat versions appropriately titled “APEC leader suit”. The knock-offs are being sold for around 200 yuan (33 U.S. dollars) to more than 1,000 yuan on Taobao.com. Owner of online store Fuzhuangdashijie8866 said the suit is selling so well rush to delivery will still take 20 days to arrive after a buyer places the order. 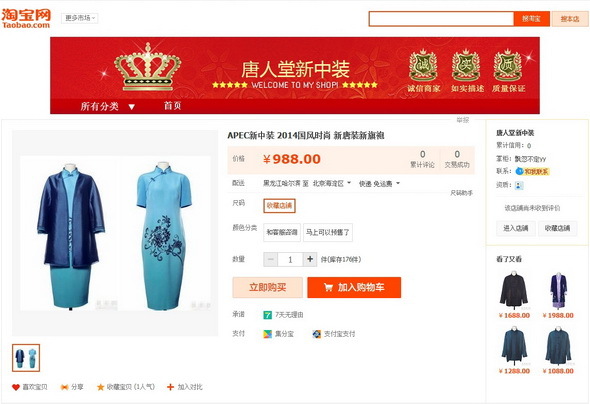 The store, however, has changed the name “APEC leader suit,” which it only used for two days to promote the design. They said the portal’s management staff advised retailers to change the name for fear of getting entangled in patent infringement disputes. 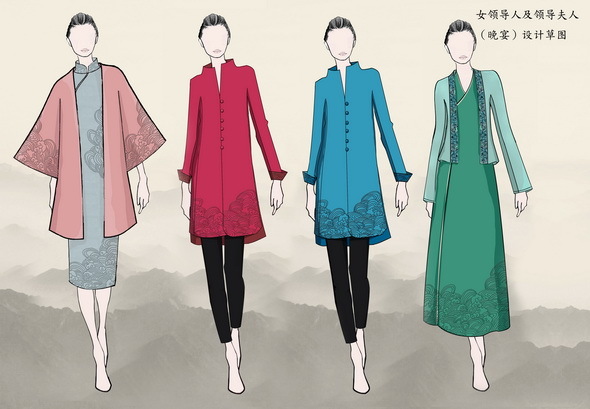 Although the specially-designed suits have no trademark, the texture is exclusively made for the suits donned by the APEC leaders and patented, said Kou Yongqi, manager of High-Fashion Silk (Zhejiang) Co. Ltd.. 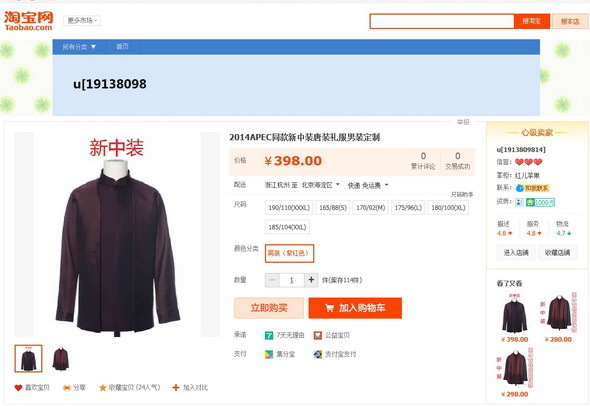 The company is one of the two authorized clothing suppliers for the genuine “APEC leader suit”. It produced 5,000 meters long silk and damask fabric rolls for producing the official suits. “The damask texture has not been marketed. 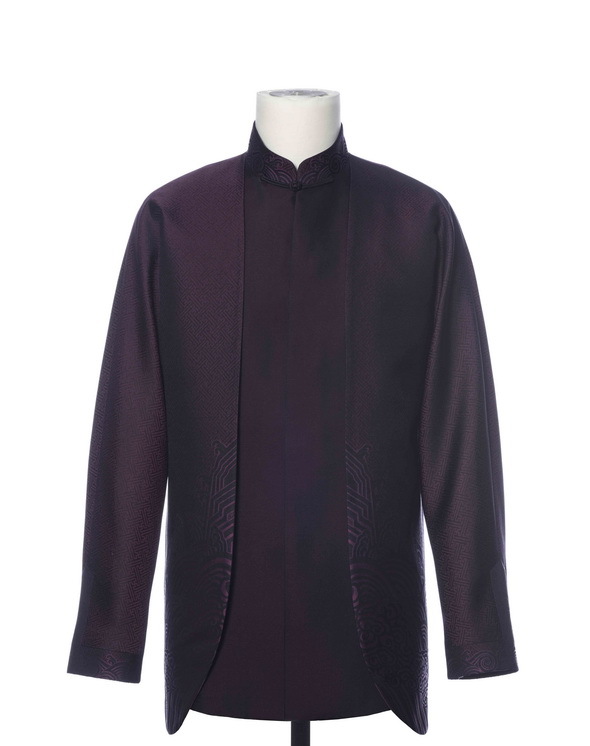 It was only exclusively used for the APEC meeting custom-made clothes,” said Kou. He said, however, he did not mind the knock-offs sold online, which only mimic the outer design. Song Huizhou, one of the 12 selected fashion designers for the leaders’s suits, does not mind the widespread clones either. “Fashion design is a collected wisdom. It is not like a trademark product,” she said. 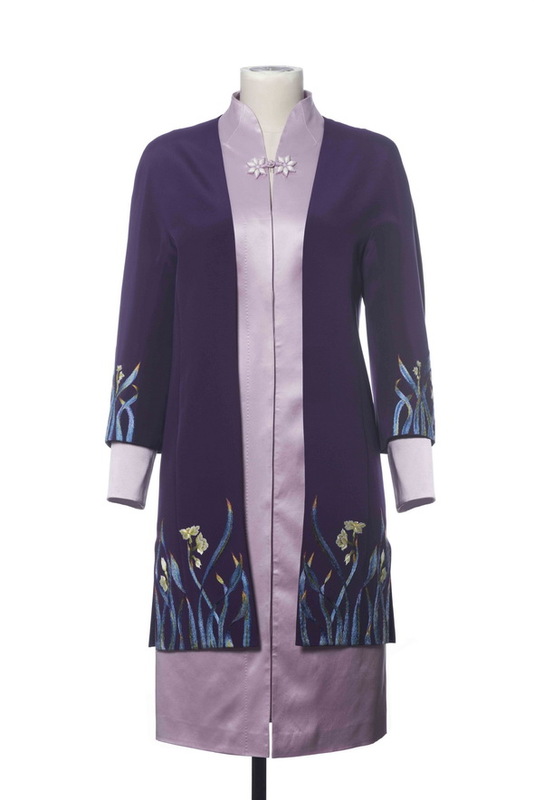 Zhang Zhifeng, brand founder and art director of NE Tiger, the company authorized to make the female leaders’ long embroidered buttoned jackets for the APEC gathering, called the suit “New Chinese Clothing” style, blending traditional Chinese clothing culture with new art and production technology. “Knock-offs cannot be a real challenge to good fashion design. In the fashion world, it is common to see something getting imitated instantly,” he said. Zhang told Xinhua he believes people’s love of the “New Chinese Clothing” fashion is a sign of national self-confidence and an acknowledgement of the country’s own fashion products. 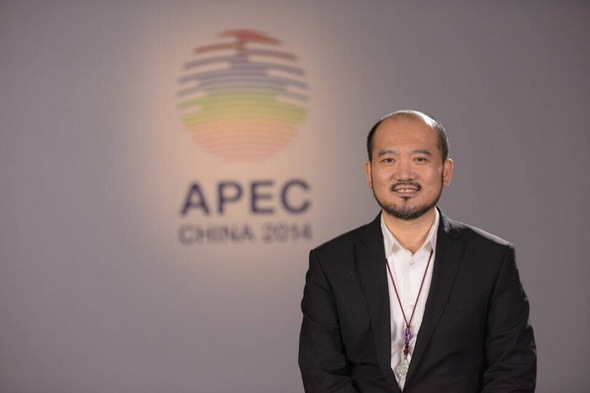 A total of 71 firms, 259 designers and 18 higher-learning institutes put forth bids to make the 2014 APEC leaders’ suits, which started from December 2013. The final draft design was decided in September. This year marks the 25th anniversary of the APEC, which has been a top-level and most representative cooperation mechanism that covers a wide range of areas in the Asia-Pacific Leaders and representatives of the 21 APEC economies. Leaders and representatives from the 21-member APEC economies attended this year’s meeting. Incorporating the host country’s fashion into the meeting began when US President Bill Clinton handed out leather bomber jackets in Seattle during 1993’s forum. Leaders also donned blue-and-gold South Korean silk overcoats called durumagi in 2005, followed the next year by flowing silk ao dai tunics in Hanoi. Let’s share photo report dated on November 10, 2014 !!! (APEC) Economic Leaders’ Meeting which takes place in Beijing from November 10 to 11.